An easy, very photogenic subject, I know, but pleasing shapes and textures nonetheless. The subject also provided more practice at focus and dof control which is my current "project". I know this will sound silly but I'm struggling to get my head around where the light is coming from in this shot (from which direction, I mean). If anyone can shed any light (ha ha) I would be very grateful. Beautiful shot, love the detail. It looks gorgeous on black. Oh what a lovely line up! Great light too. I like the contrast of the background, how the thistles glisten and composition line-up. Great capture! I can't shed any light on the light issue (I see what you did!) ;) because it's hard to tell in b&w particularly - however I think this is a beautiful shot! Great light (wherever it's coming from!) and dof. Easy, but beautiful. I get a few shots like this, too, where the light seems to be "backlit" but there is no direct light. I think sometimes there is "ambient" light that causes things like this to "glow". @kerosene Thanks for your nice feedback - and thoughts on the light question. I really must pay more attention to the light when I'm taking a shot. @thewatersphotos Maybe you're right about the ambient light, Gary. I looked and looked at the original colour shot and couldn't work where the light was coming from. 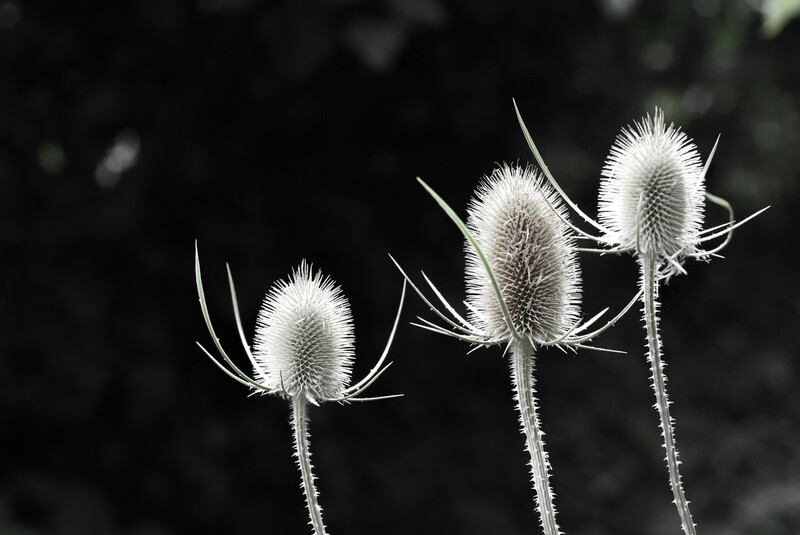 These teasels are often found near water. Could the light be reflected from the water? I don't know really. It is a lovely shot.